Extreme Jobs: "I am a Circus Performer" | StyleAble Fashion For Everyone! “I love the rush I get when I am on stage. Everything seems to go blank, all the doubts and fear vanish and are replaced by concentration and focus. I love that sometimes I don’t feel like performing, or I might be doing something technical so I’m not smiling, but when people start clapping it always puts a smile on my face. What I hate most is the hour before a show – that’s when I am most stressed. Sometimes I feel like I can’t breathe, but luckily that always goes away once I’m on stage. By Lily Raptor. “I have been a performer for three and a half years. Growing up I was always dancing and being part of various shows (I even did a bit of satirical cheerleading in my time!) but I never considered it as a career. And then I met my partner Edward in Nepal. He had been a circus performer for several years and he is the one who got me into this. Now we run Chivaree Circus together and I couldn’t be more pleased with my life choices. 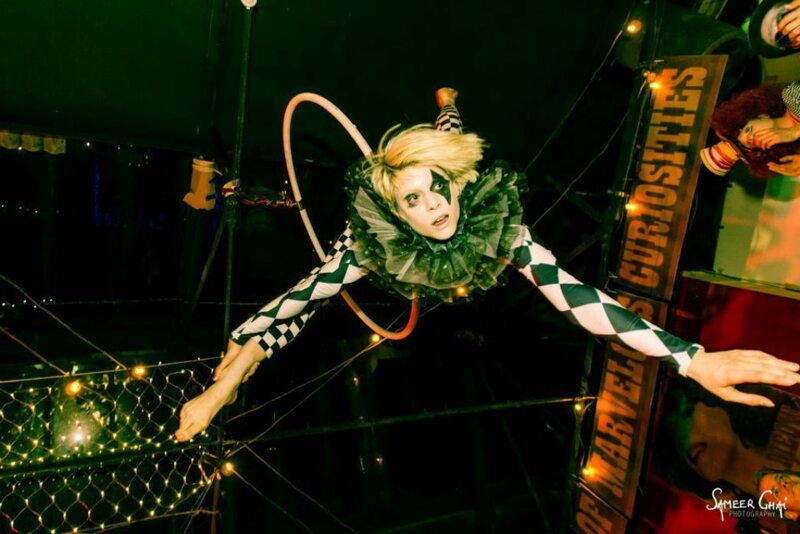 We created Chivaree Circus so we could coordinate amazing other worldly performances – and that’s exactly what we do. It sounds crazy, but sometimes I feel like we started Chivaree by accident! We wanted to go on an adventure; we were both working in the publishing industry and we were both a little bored. It’s quite hard to work in an industry where everyday people tell you its dying. We wanted some excitement and there’s nothing more exciting than circus, where everything is possible. So we decided to set up a group to go and do some festivals. One thing led to another; we asked a friend to design a logo, organised a photoshoot, made a website and within two weeks we had a registered company! I don’t think we really knew where this would take us at that point, and that’s what was great about it. On an average day I wake up, read the news, do a bit of admin. I then have lunch, train for a few hours, either aerial hoop or contortion. And then perhaps work on some new costumes or props, trying to find new ideas for outfits or a photoshoot. If we’re performing I like to get to the venue early to set up and run things through. Sometimes I am up until 4 in the morning trying to finish a pair of horns or a golden corset for this or that job! We make all of our costumes in house. The style always depends on the theme of the outfit, but also on the discipline the costume is going to be used for. That can be quite tricky. You can’t wear a corset when doing contortion because it’s too tight, you can’t wear floaty fabrics when performing with fire because that’s dangerous, so you have to adapt. I love making costumes, I draw a lot of inspiration from literature or history. I had a phase when I was fascinated by patterned brocade and French 18th century style fabric and outfits. At the moment I’m really into pirates so everything has trimmings. I want to sew pompoms everywhere. Before a show and when I create new acts I watch a lot of videos online, I scout the internet to find inspiration, to find new music, go to places like Pinterest and look for new stories to tell. I like to reference films, books and dance styles. Once I have an idea of what I want to do, I put the act together and I try and practice it everyday. I take my music with me when I’m on the tube and go through the act in my head, I also like to perform it in front of close friends, to see what they think of it. We do private parties, corporate events, street fairs, nightclubs, it varies. But even when we do a relatively simple booking, a fire show or stilt walking for example, we always try and bring a little bit of our own world with us! Our ideal booking would be when a client comes to us with a theme for a party and asks us to come up with ideas for the entertainment. Recently, one of our regular clients asked us to put together a proposal for a pirate party. That was great fun, we put forward a choreographed sword fight, singing mermaids, fire spinning wenches, knife juggling renegades, stilt walking pirates, Peter Pan doing a cameo on the aerial hoop and an immersive treasure cave! Chivaree Circus ::: welcome to our world from Chivaree Circus on Vimeo.